People are influenced by the things they see and learn from people around them. In a country like Nigeria, people have learned and gotten information in stories told to them. These stories come from information and ideas about culture, customs and people’s ways of life passed on from one generation to another. Nigeria has a lot of cultural heritage, not only Nigeria, but Africa as a whole has lot of cultural heritage and beliefs that has continued even to modern times. Culture is a special symbol of a people passed from generation to generation, it changed as each generation, contribute to its experience of world modern life, which has made people not to respect culture, but cultural practices are the way we do things, values and beliefs in essence culture is culture and should be respected. Knowing each other culture and heritage help us to live peacefully with each other. Heritage is a tradition passed from family, community and the place where one is raised. The Efiks are a group of people located primarily in the southern part of Nigeria, they speak the Efik dialect which belongs to the Cross-River family, they migrated down to Cross-River from Arochukwu and found settlement in the Calabar creek town. Calabar is the main town in cross-river state. It’s known that they were the first to embrace western education in the present day Nigeria. The Efiks do have an interesting tradition with one of them being the fattening room practice, here virgins are well fed, massaged and made to sleep for long periods, in the fattening room, the virgin goes through domestic training of home management, how to respect and make their husbands and his people happy. They are well trained by experienced women in marriage, and at the end of the process, people are invited to witness and celebrate in honour of her, the ceremony is celebrated with traditional dances like the “Ekombi” and other forms of entertainment. They also conduct their marriage ceremony in the home of the bride, where marriage rites are being carried out with the display of cultural dances to back up the ceremonies, their Efik women put on the attire called the “Onyonyo” or long gown. 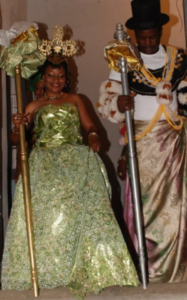 The Efik men belong to a group called “Ekpe” whose members are guardians of the peace messages of the ancestors. Their activities include making laws and punishing offenders. They also have their masquerades cultural display where you have different masquerades during their festivals representing their different meanings. Their cultures are manifested in various ways of life. The festivals of the Efiks people of the cross river state brings tourists from all nooks and crannies of Africa into the state to enjoy themselves, and to do business, these festivals include; the cross river state Christmas festival that will rival any other festival even in Africa, with over 30 days of endless fun, carnival games, cultural display, art exhibition and musicians from all over Nigeria full of so much fun with different dances. These attracts a lots of people from far Africa to their Tinapa business resort which is a beautiful sight to behold, there is always a beautiful experience awaiting the tourist visiting cross river state. The Efiks are inclined to vegetables and sea food, fresh fish soup, the white soup, Afia, Efere, the Afange, Edikang Ikon, these are delicious foods or dishes that you will love to taste. The Efik people are fun loving and amazing, it’s a wonderful place to be, especially the fun period of December. Thinking of coming to Nigeria, do ensure you pay a visit to Calabar the capital of cross river state to see more beautiful things.